Hurricane Harvey smashed into Port Aransas, Texas, a small coastal town, on Friday, August 25. It then proceeded to pound neighboring areas with deluge after deluge of rainfall. As the storm continued to hover over Texas, it made a record three different landfalls in three different areas, dumping more than 50 inches of water onto the United States’ fourth-largest city—Houston. Along with all the other losses a storm of this magnitude can deliver, affected areas are now dealing with a level of humidity that even the tropical South seldom experiences. As floodwaters slowly recede, owners of flooded homes are re-entering their houses to make a last-ditch effort to curb mould and mildew growth. Hurricane Harvey is perhaps the most extreme example of the level of humidity that excessive atmospheric moisture can trigger. But the storm doesn’t need to be nearly this catastrophic to hike humidity levels well over the recommended 30 to 50 percent. In this article, learn creative ways to bring your indoor humidity levels down in a hurry if you need to! P.S. At the end of this article, find out how to save 20 percent off on clean air appliances! The name “hygrometer” can sound daunting to ears that have never heard this term before. But the hygrometer is actually a very simple, small, inexpensive gadget you can pick up at nearly any home goods store. The hygrometer’s job is to measure the level of humidity present in any indoor or outdoor space. For example, if you have a hygrometer and you carry it into the bathroom with you before you shower, you might find the humidity level is around 40 percent. But take another measurement after your shower, and you will see with your own eyes just how quickly the humidity in the air around you can rise! 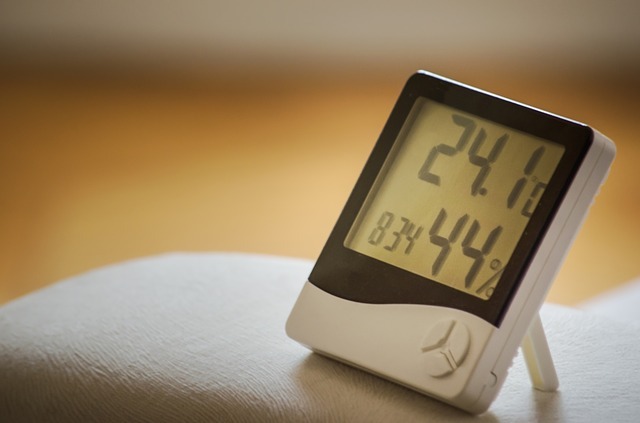 A hygrometer is a great way to determine whether you have problem areas in your home where the humidity tends to stay at a higher level than what is healthy for you and your family (in general, this is any level higher than 50 percent). For many people, such problem areas include the bathroom, basement, attic, kitchen, and laundry rooms. A hygrometer can also give you a heads-up for when humidity is too low for your body to maintain optimal respiratory health (in general, this is any level lower than 30 percent). So this is the first tool you need to be able to continually monitor the humidity levels in your indoor air. Excess sweating leading to dehydration. When the humidity in the air is higher, the body cannot cool itself as efficiently. So it sweats more trying to bring its internal temperature down. Without replenishing fluids, this situation can lead to dangerous levels of dehydration. High internal body temperature leading to heat stroke. Like dehydration, heat cramps, heat exhaustion, and heat stroke are potentially life-threatening conditions. When the body reaches a certain internal temperature, it becomes unable to cool itself down without assistance. Excess humidity raises the risk of this occurring. Too much moisture incubates bacteria, fungi, parasites, and germs. There is literally nothing a mould spore likes more than a nice rich bath of humidity. Once these types of allergens take up residence in your respiratory system, they will feed on humidity to multiply and make you ill. The next time a storm system rolls in, you may notice in a new, fresh way just how fast the humidity levels in the air can rise. The most typical way that people address fast-rising indoor humidity levels is by cranking up the air conditioning, which absorbs moisture and pushes it out of your home while pushing cooler, drier air in. We do this in our cars, too, when the windows start fogging. But sometimes your air conditioner cannot cope with fast-rising humidity. This is especially true if you are relying on window units and you don’t have one installed in each room. Install a dehumidifier. As its name suggests, a dehumidifier’s sole function is to extract excess moisture from the air on a continual basis to maintain a constant level of humidity inside your home. Make your own emergency dehumidifier. Use a desiccant (such as rock salt, kitty litter, or calcium chloride) to absorb excess moisture naturally. Turn on your bathroom, laundry room, and/or kitchen vents or fans and let them run. These vents will begin extracting excess humidity and pushing them outside. Run your ceiling and floor fans. Air circulation and ventilation are key players in lowering your indoor air humidity levels rapidly. Also be sure your clothes dryer vents to the outside. Avoid taking hot showers. Short, cool showers are best when you are trying to lower humidity levels inside your home. Place all freshly watered houseplants outside. All that water has to evaporate somewhere, right? It will go straight into your already humid indoor air supply unless you take your houseplants outside to dry off. Pull up area rugs and runners. Carpeting holds moisture very well, so you will want to remove carpets if possible. Re-caulk and weather-strip windows, doors, cracks, and other vulnerable areas. This longer-term fix can keep humid outdoor air from sneaking inside. Our Breathe Clean Air Event is still going strong! You can save 20 percent on a variety of clean indoor air appliances for a limited time only!